Know Your Bible is a concise, easy-to-understand guide to God's Word-giving you a helpful and memorable overview of all 66 books. For each Know Your Bible provides data on the author and time frame, a ten-word synopsis, a longer (50-100 word) summary, thoughts on what makes the book unique or unusual, a listing of key verses, and a "So, What?" section of practical application. It's a fantastic resource for individuals and ministries! 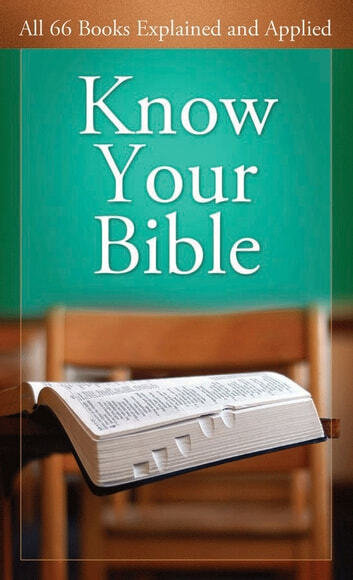 This book is a great resource to use for Bible Study. Very good overview of each book with themes, key verses, and my favorite "Unique & Unusual" info. Very good and easy to follow much enjoyed. Too vague, not in depth enough to teach as the title suggests. Laking backing scriptures making it easier for laymen to understand. Even a child would be left with many questions unanswered, and doesn't leave you thirsting for more of His prescious word. Seems far too simple, even for simple minded souls. My 5 year old grandchild thought it didn't explain enough for her, but it did get her to reading her own bible. Many people wouldn't have taken the time she did to get to the meat of each book I read to hrt from this book, I feel Childrens Bibles explain better, without over complicating what the message was behind the scriptures. One of the best book I have tread.